The mortal remains of legendary filmmaker Mrinal Sen were consigned to the flames on Tuesday after hundreds of mourners from virtually all walks of life, including showbiz, took part in the final journey that was shorn of flowers to honour his last wish. Sen's followers, friends and other personalities paid their respects by getting a glimpse of the master for one last time as they matched steps for over a kilometre with the funeral cortege before it wound it's way into the Keoratala crematorium in South Kolkata. Earlier, Sen's body was brought from the Peace World mortuary to near Priya Cinema at Deshapriya Park in south Kolkata where he had previously spent many years of his life at a residence named 'Prabhab Praha'. His son Kunal Sen said no garlanding and other rituals were to be observed. "I visited him often. Owing to his age, I knew that this day would come. But even if we think we are prepared, it is never enough. I used to call my father bandhu (friend). My father asked us not to make a spectacle of his death and he did not like it. We honour his wish," said Kunal, who had flown down from the US. "He never wanted his body to be covered in garlands," said the bereaved son. 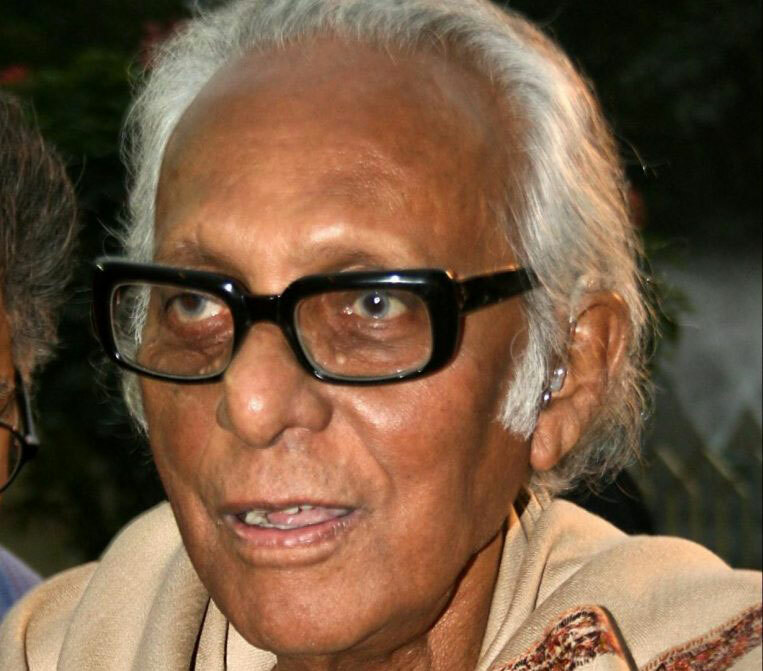 Mrinal Sen, 95, a recipient of country's highest cinematic honour, the Dadasaheb Phalke Award, breathed his last at his residence in South Kolkata's Bhawanipore area on December 30 due to old age complications. His demise signalled the end of an important era in Indian film-making as Sen was so long the last surviving member of Bengal's Trinity of directors - that also included Satyajit Ray and Ritwik Ghatak - who ushered in the New Wave movement in Indian cinema. "He was a happy-go-lucky man with an interesting and colourful personality. He was a master filmmaker," said Sandip Ray, son of Satyajit Ray and himself a noted film director. Talking about paying true homage to Sen, Ray said: "I think his films should be restored and revived all over again. It should be shown on big screens so that more people can see it". He said the restoration of films is a neglected area in India and it should be done immediately. His films should be broadcast not just now but throughout the year. "No one was able to copy his unique film making style," he said. Bengali superstar Prosenjit Chatterjee said Sen had taken "Indian cinema to another level". Poet Shankha Ghosh, actor Ranjit Mullick, filmmakers like Anjan Dutt, Aparna Sen, bengali actress Madhabi Mukherjee, Mamata Shankar, Nandita Das, Left political leaders and many others also walked in Sen's last journey. Condoling Sen's death, Left Front chairman and senior CPI-M leader Biman Bose said: "He was a very good human being which is reflected in his films. We need people like him in today's society". Sharing how "brave" Sen was, actress Madhabi Mukherjee said: "He never had greed, and he never bothered about hits and flops. He had a vision and worked for it." She said that Sen always shared the message that he wanted to. Recalling his friendly nature, she said he had a great sense of humour and "there is no other communist like him". Virtually echoing Mukherjee, Nandita Das said his films were not just for entertainment and delivered important messages. She pointed out that the Padma Bhusan awardee made films which spoke about the "disturbing" realities of society. Director Srijit Mukherjee said that for those who haven't been to a film school, it is like losing the Guru (teacher). A memorial meeting organised by Sen's family will be held on January 5 at Gorky Sadan. Born on May 14, 1923, at Faridpur (now in Bangladesh), Sen made his first Bengali film, "Rat Bhore" (The Dawn), in 1953 starring Uttam Kumar. But it was his second directorial effort "Neel Akasher Niche" (Under the Blue Sky) that received acclaim in the country for its lyricism and humane qualities. He made altogether 27 feature films, most of which bagged prizes in India and abroad.